This two part five plus hour adaption of Shuji Terayama’s 1966 novel Ah Wilderness will either delight or bore its audience. Set a couple of years in the future the film follows two young men who join a boxing program and becomes friends. We watch the arc of their lives and see what brought them to the present. Despite the dystonia setting the film is firmly a sprawling personal drama. How you react to the film will depend on your love of long narratives. While the film has been compared to TV series that people binge on the ebb and flow of the film is decidedly literary and cinematic. Technically the film is well done on every level and if you are a fan of great acting you're in for a treat. 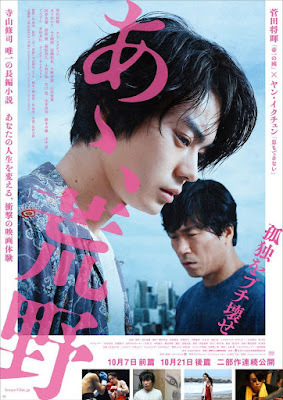 The deciding factor as to whether or not to see this film will entirely depend on how you like sprawling dramas that never leave the small confines of daily life. I was fine for a a while but somewhere in the first part I realize that my interest waned and it made getting through the rest a chore. Had I not had to watch the film in a single six hour block in order to cover it I would have liked it more. Bless Fantasia for trusting audiences to try something as atypical genre wise, but screening it in a single block may have lost viewers.